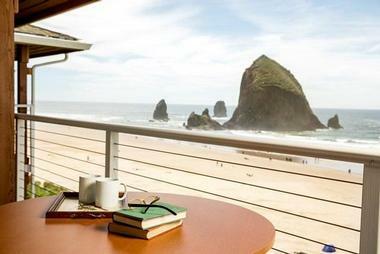 The Hallmark Resort & Spa in Cannon Beach in Oregon is situated on a beautiful stretch of Pacific shore. The pounding surf, the sand, the lighthouses and the immense sea stack, known as Haystack Rock, combine to delight the eyes, ears and the mind. 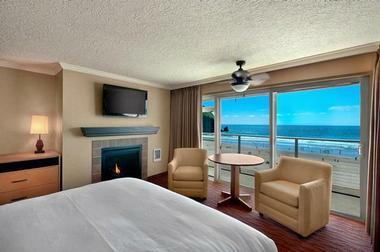 The resort is right on the beach, and only a short walk away from the vibrant seaside town of Cannon Beach. The resort and the community is only an hour and a half’s drive from Portland and travelers from Seattle can reach Cannon Beach in under four hours. The history of the resort may be of interest to those who enjoy knowing the background of the places they visit. Explorers Lewis and Clark were the first Europeans to set foot on this shore in 1806, they were accompanied by their Native American guide, Sacagawea. Lewis and Clark encountered a group of Native Americans from the Tillamook tribe, who were butchering a beached whale. A whale statue stands at that site to commemorate the meeting and the successful bartering that netted the explorers three hundred pounds of whale blubber and a container full of whale oil. In 1846, a Navy schooner named The Shark was shipwrecked just off the shore of present-day Cannon Beach. In 1895, a cannon from that ship was found, buried in sand on the beach and its discovery gave the town its name. The resort has two indoor salt-water swimming pools with saunas and hot tubs to add even more relaxation to the vacation. A fully-stocked fitness room is available for guests who want to keep up with their exercise routines. Pet exercise areas are also offered by the hotel and there are special wash-down stations and drinking fountains designed for the family pooch. 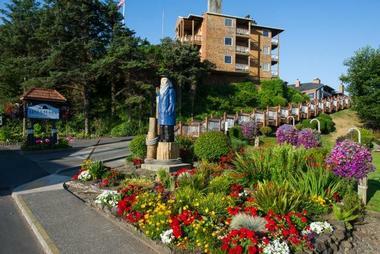 The Hallmark Resort & Spa is ideally situated to help guests make the most of their vacation on the Oregon coast. 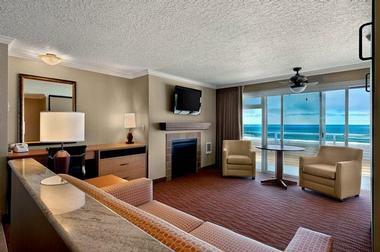 The resort offers standard rooms, suites and four beach houses; most of them have an ocean view. There are four beach houses for guests to relax, entertain in and use as a peaceful, cool haven to escape the midday summer sun. Three of the beach houses have decks with beach access and a barbeque, the other (House 396) has a rambling backyard leading to the beach. Comfortable beds with fresh linens await tired limbs at the end of the day and vacationers can relax in casual sitting areas containing gas fireplaces, a big screen TV with a DVD player or may wish to curl up on the inviting sofa while reading the daily newspapers that are provided to guests. The beach houses have fully equipped kitchens with dishwashers, range tops, microwave ovens and a full supply of dishes and utensils. Fresh towels are provided daily and limited housekeeping is available. House 380 is a three-bedroom, two bathroom, two level beach cottage. 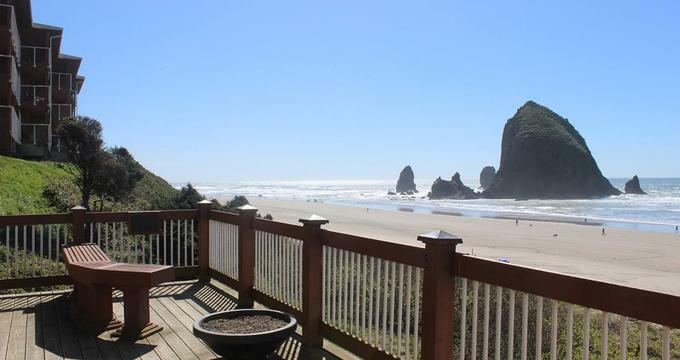 Floor to ceiling windows in the living room grant panoramic views of the beach, Tillamook lighthouse and Haystack Rock. On the main floor there are two bedrooms with queen beds and upstairs a loft bedroom suite sports a king sized bed, a private bathroom with a Jacuzzi and 180 degree views of the surrounding area. House 301 is a one-level ranch style beach house that sleeps nine. With four bedrooms and three bathrooms, this is a beach house that can house large families or a group of friends. Even the family dog is welcome at this pet-friendly home. Two of the bedrooms have a queen bed, a third has a king bed and the other has a twin and a queen bed in the same room. Vacationing is easy here in a beach house with lovely ocean views, a full kitchen to provide meals and snacks and a washer and dryer to clean up sandy, salty clothing. House 388 is a four-bedroom, two bathroom oceanfront beach cabin that sleeps nine. It is a pet-friendly accommodation where the family dog or cat can enjoy a getaway and perhaps chase the seagulls on the beach. The main level has one bedroom with a queen and a twin bed while upstairs there are three bedrooms, two with queen beds and one with two twin beds. House 396 is an oceanfront beach house that sleeps ten, containing four bedrooms, three bathrooms and is pet-friendly. Beach lovers will appreciate the lounge chairs in the big backyard and the outdoor shower to wash sand off before going back inside. There is a washer and dryer to clean up sand-laden clothing. The master bedroom is on the main floor and features a king bed and a private bathroom. Upstairs, in dormer bedrooms under the eaves, are three more bedrooms, one with four twin beds and two with queen beds. At the main resort building, pet-friendly rooms are available, and accommodations for all tastes and budget are ready to receive guests. All rooms in the resort building have high speed Internet and Wi-Fi, microwaves, fridges and coffee makers with locally-roasted coffee. Large-screen TVs with DVD players are in every room and complimentary video rentals and popcorn are available at the front desk. The hotel lobby is always stocked with free freshly-baked cookies. The Oceanfront One Bedroom Suite welcomes parties of up to five guests, has a queen bed and a twin bed in the bedroom and the living room has an innovative queen pull-down bed that folds back up into the wall when not in use. The Oceanfront Two Bedroom Suites have two twin beds in one bedroom, a queen bed in the other and a queen-sized pull-down bed in the living room. Six can sleep comfortably in this suite and can enjoy the benefits of having a full kitchen. The Junior Spa Suite features a two-person Jacuzzi tub in the bathroom, a queen bed, a sitting area, a small fridge and a partial ocean view. Other rooms in the hotel have obstructed ocean views or none at all, but they are budget friendly and only steps from the beach. There are no restaurants at the hotel, but just a few minutes down the road is the seaside town of Cannon Beach which has something for everyone’s taste and budget. Vacationers can feast on seafood, pizza, vegetarian fare, English-style fish and chips, comfort food and crepes. There are many varied venues in which travelers can eat in including cafes, wine bars, pubs, coffee houses or in a public house that doubles as the town’s hardware store. Visitors wanting snacks or treats will enjoy the ice cream parlor that also sells candy, the town chocolatier or the bakery that serves up pastries, cakes, and cookies. Those who fancy a drink may wish to visit the winery, the two breweries and the whiskey distillery, all of which are within the town of Cannon Beach. Elements of the Sea is the spa at the Hallmark Resort. The soothing waterfall and roaring fireplace in the waiting room lulls and calms clients even before their treatment begins. Himalayan salt lamps purify the air and add positive ions to the atmosphere. Massages can be customized, or the client can choose from Swedish massages, Deep Tissue Massages, Hot Stone therapy and pre-natal massages. Facials, body scrubs and wraps renew, detoxify and nourish the skin; anti-aging treatments are also offered by the Elements of the Sea spa. Energy work, such as Reiki and Cranial-Sacral massage, balances the energy of the body and mind and promotes healing, relaxation and wellness. Foot and hand massages, reflexology, aromatherapy and a full range of services for men are on the menu at the spa. Small, relaxed wedding parties with no more than 50 guests may hold their ceremonies on the beach directly in front of the hotel. Local caterers familiar with the hotel will be happy to provide fine dinners, casual barbecues and will bring the champagne as well. The Hallmark Resort & Spa has unique venues and a variety of function spaces, both indoors and outdoors, that welcome up to 140 persons. The hotel’s experienced event professionals will look after all the details of the meeting or gathering. The resort’s business center contains a computer, a printer, a copier, a fax machine and offers free local calling and UPS pickup and delivery. Professional catering is handled by local purveyors. Guests who love galleries and shopping will find everything they are looking for in Cannon Beach. Whether it’s a trip to Costco or a search for antiques, art and hand-blown gas, Cannon Beach has something for every shopper. 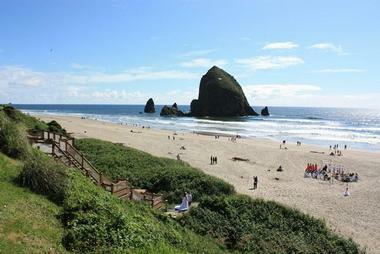 Cannon Beach has a theater, three museums, a small aquarium and a local company that offers zip-line tours for the adventurous. Vacationers wishing to try out the waves will find surfing equipment rentals, purchases and surfing lessons. Nature lovers will find their wildest dreams come true on this stretch of the Oregon coast. Gray whales pass close to shore in the winter and the spring, and alert visitors can delight in the sight of juvenile whales. Sea otters and Steller sea lions bathe in the sun of the rocky shoreline. Bird watchers will delight in the array of raptors in the area which include bald eagles, California condors and osprey as the regular visitors. That hooting sound heard in the night is the cry of the Northern Spotted Owl or the Burrowing Owl. Perhaps the best-known trail in the Cannon Beach region is the one that takes hikers to the peak of Saddle Mountain. It’s a difficult climb, but the view is worth it. On a clear day, those who have made it to the summit can see the Columbia River flowing into the sea and the superlative vista of the Cascade Mountains of Northern Oregon and Washington. The wooded trails and open meadowland of the mountain are alive with colorful wildflowers and the eagle-eyed hiker might glimpse Roosevelt Elk, pygmy rabbits, tree voles and Columbian White-Tailed Deer or perhaps even cougars, black bears, gray foxes and wolves. Also note that The Oregon State Park Commission lists Bigfoot on their list of local wildlife. Back to: Romantic Weekend Getaways in Oregon.